ISHINOMAKI, MIYAGI PREF. 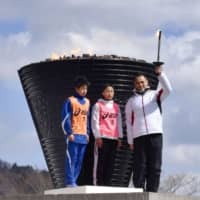 - The city of Ishinomaki in Miyagi Prefecture held a ceremony Sunday to return the 1964 Tokyo Olympics cauldron, after its four years on display to recognize the area’s recovery from the March 2011 earthquake and tsunami. The Japan Sport Council offered the cauldron to the city in December 2014 after it was removed from the former National Stadium in Tokyo. The loan period expires this month. The former National Stadium was demolished to make way for construction of the new National Stadium that will be used for the 2020 Tokyo Games. During Sunday’s ceremony the cauldron was lit for the last time in Ishinomaki, and many local residents took photos. Miyagi is one of the three northeastern prefectures hit hardest in the 2011 disasters, the two others being Iwate and Fukushima. “We made a lot of memories. We’re just thankful (for the cauldron),” said Kazuo Ito, 72, chairman of the city’s sports association. The association has organized marathon events to mark the progress of reconstruction from the disaster, with the cauldron being used as the starting and ending points of the marathon. The cauldron will be displayed in Iwate and Fukushima, as well as Kawaguchi, Saitama Prefecture, where it was created, before being transported to the new National Stadium.